Saturday afternoon the Philadelphia Wings (3-12) where roughed up by the Calgary Roughnecks (8-8) 18-13, which mathematically eliminated the Wings from playoff contention. The loss also marked the end of the Wings’ home schedule. A return five years in the making was bittersweet to the fans as they didn’t want to see it end just yet. As each fan entered the arena, the game day card with team rosters where handed out. Each home game it showed a different player or two. This final home game was the team photo. Players dressed in the home black jerseys, and everyone smiling. Evidence that the players love playing here in Philadelphia and for the fans. Calgary jumped out to a 4-0 lead before Wing’s coach Paul Day pulled Doug Buchan in favor of Gowah Abrams, who saw his first NLL action since being called up from the ALL’s St. Catharines ShockWave. Abrams let in the first shot he faced from Dane Dobbie but settled in after that. Both goalies would switch in and out again and before it was over Buchan stopped 8 of 17 shots faced in 20:41 of play while Abrams stopped 26 of 35 shots faced. The Wings finally got on the board at 2:48 of the second when Jordan Hall converted on the power play. Kiel Matisz scored a power play goal 57 seconds later and then added a second goal 29 seconds later to bring the Wings within two. 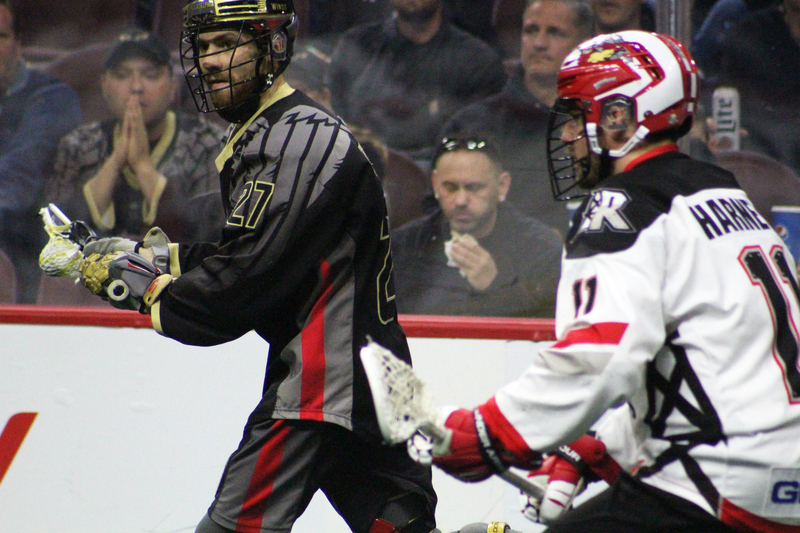 But Greg Harnett replied with a shorthanded goal shortly after and Tyler Burton scored a late goal to close out the half with the Roughnecks up 7-3. As the third quarter started it seemed both teams left their goalies in the locker room as they combined for 12 goals in the third with Calgary besting the Wings 7-5 for a 14-10 lead. Philadelphia’s Josh Currier scored four times in the frame including a highlight-reel wraparound goal, while Curtis Dickson had a hat trick for Calgary. Calgary started the fourth by scoring twice in 33 seconds to basically put the game out of reach as they would go up by eight. “I think two things,” said Wings’ captain Kiel Matisz. “From the coach’s perspective, it’s just about competing. Realistically, teams change every year in this league and most of us will be back next year. But you’re fighting for a spot already. Two Wings reached milestones in the game. Jordan Hall collected his 700th career point with a goal. Faceoff specialist Trevor Baptiste set the all-time rookie record for face-off wins (280), breaking the record that Jake Withers set just last year. He currently sits at 286 with three more games to go. 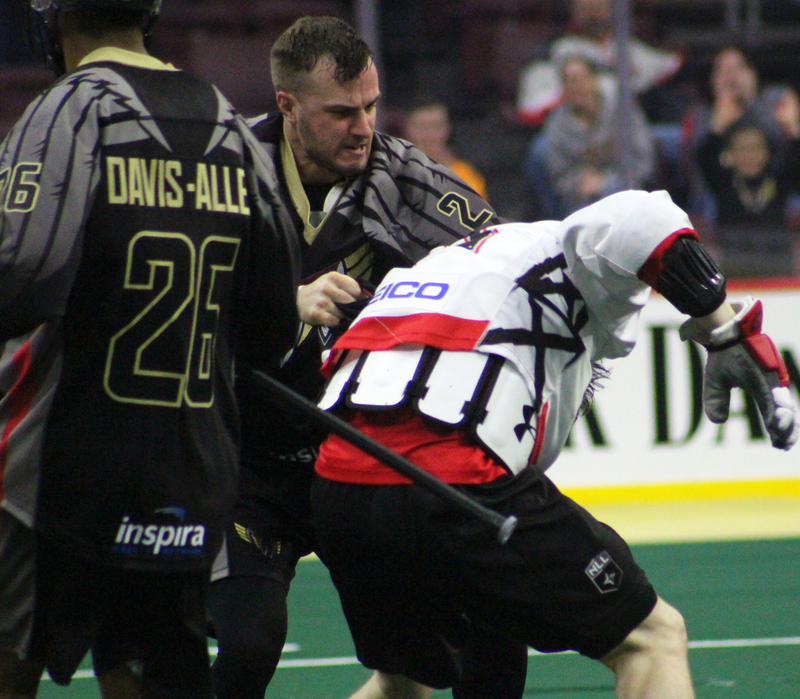 Curtis Dickson (4G/6A) and Dane Dobbie (4G/7A) led the Roughnecks’ offense. Both players combined for 32 of the teams 52 shots. Riley Loewen, Dan Taylor and Rhys Duch each scored twice. Christian Del Bianco was stellar in goal stopping 46 of 59 shots. Josh Currier (5G/2A), Kiel Matisz (2G/5A) and Jordan Hall (3G/2A) led the Wings’ offense. Both teams went 4-7 on the power play. The Wings will be on the road for the final three games. This weekend they will face Saskatchewan on Saturday night, then travel to Vancouver for a Sunday afternoon game (6 p.m. eastern). The Wings are still searching for their first road win of the season.